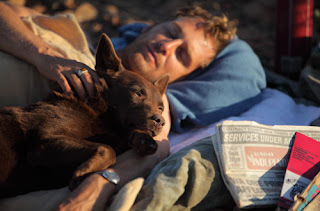 Putting aside the fact that Red Dog is (very loosely) based on a true story, something that many of you know I take particular issue with, it is otherwise a very entertaining and beautifully shot film. Red Dog is a kelpie / cattle dog cross that became a part of the wider Western Australian community as a result of his travelling ways. A young truck driver walks into the local pub at Dampier, in Australia's far north west, amid what appears to be a brawl, it soon turns out that it is an attempt to put down a dog that has been poisoned. We soon learn that this isn't just any dog though, as more and more people turn up at the pub and relate to the truck driver the many adventures of Red Dog and the many ways in which he touched the hearts and minds of the wider community. 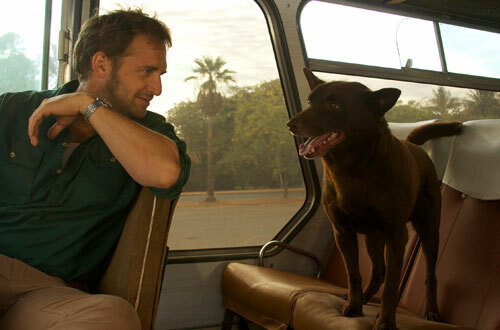 With a considerable Australian cast featuring the likes of Noah Taylor, Leone Carman, Luke Ford, Rachel Taylor and a cameo by the late Bill Hunter, all strutting their acting ability with veritable ease, it is not even the American that steals the show, even Josh Lucas must bow before the might of the acting provided by Koko the dog, who shows considerable emotional range and makes for a wonderful central character that is able to carry the film with ease. The film is magnificent to look at with some excellent cinematography by Geoffrey Hall who recently proved his noir ability with Dylan Dog: Dead of Night. Unlike Dylan Here we have bright colourful outback shots with vast expanses and roads that go on for miles. Not to mention plenty of red dust and scorched earth! The music selection is also great with a perfect selection of 70's tracks scattered through out. Red Dog is being touted as a family movie, which is a little interesting given some of the more adult themes that are present throughout, so whilst I wouldn't recommend it to younger children, jt would certainly entertain from ages 8 or up. An Australian film without the painful slow pace & without the obligatory close up shot of something totally unrelated to the movie ... refreshing!